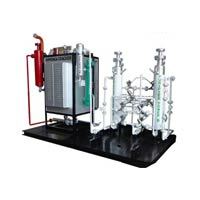 Air is taken from an air compressor and oxygen is separated form other gases, including nitrogen with the help of special grade of zeolite molecular sieves. The process involves two towers filled with zeolite molecular sieves which adsorb nitrogen and subsequently discharge waste. 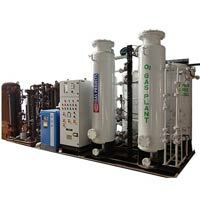 In Gas Generation Process the oxygen generated is 85-94% pure. When nitrogen saturates from one tower, this process changes over to the other tower, thus helping in the process of continuous oxygen generation. 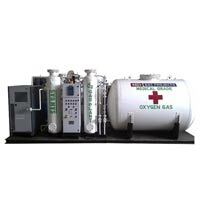 These are suitable for medical use as well, for providing oxygen round the clock. Our range is known for low cost, decreases the administrative work & ensures to provide continuous and reliable oxygen supply. Our Oxygen Gas Plant work with PSA (Pressure Swing Adsorption) technology and ensure continuous and uninterrupted supply with guaranteed purity. Using this technology, we produce oxygen gas plants that are highly economical and require low maintenance and produce the desired results in a hassle-free manner.